Though dum biriyani by default is a non-vegetarian variant, I am attempting to create a vegetarian version of it. Though the written process and list of needed things may look a bit longer, preparation is much easier. Remember to soak rice in cold water for 30 minutes before continuing to next step. Garnish is prepared first because it needs quite long time to cool down. First, heat up some oil and fry sliced onion. Once the onion is fried brown, strain and spread it on a paper towel. Keep it aside. Let it cool naturally (Do not put it under fan to cool down). Slow cooling will make onion crispy. Heat a thick bottomed cooking pot (a Kadai). Pour the ghee. Once ghee melts, add bay leaves, cardamom, cloves, cinnamon and star anise to it. Stir gently. Drain water out and add rice to the pot. Keep stirring gently until you get a smooth aroma of ghee. Level the rice. Pour water into the pot; ideally 2 cups water to 1 cup rice. So, 4 cups of water. Add a little salt. Cook the rice without a lid. This will help us to check the consistency of the rice. Because, we have to make sure the rice is not over cooked- it will kill the texture of biriyani. While the rice is getting cooked, proceed to next step. 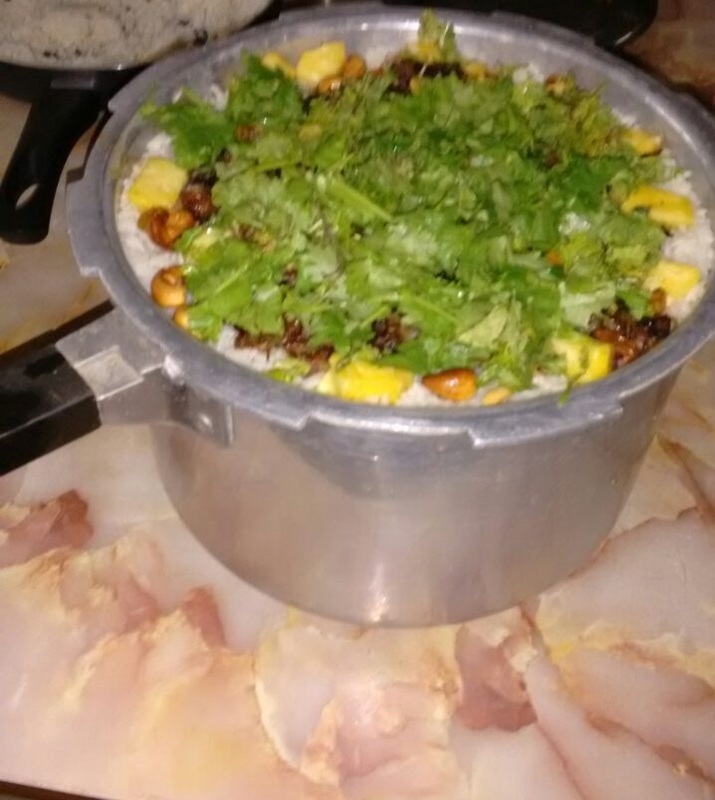 Once the rice is cooked, there will be no water remaining in the pot. Spread the rice to a large plate and let it cool under fan. Heat up a cooking pot. Pour 4 tbsp of oil. After the oil is hot, add chopped onion and ginger garlic paste. Saute it well, until golden brown. (Tip: add a pinch of salt to make this saute faster). Add chopped tomatoes, turmeric powder and stir well. Cover this with a lid and let the tomato cook well. Add potatoes, beans, carrots, peas to the pot. Stir thoroughly so that the turmeric spreads even on all vegetables. Sprinkle chilly powder and garam masala evenly on the vegetables and mix well to get an even texture. Add half portion of mint leaves and coriander leaves to this mixture. Stir thoroughly. Pour curd to this and mix well. Vigilantly add a little water to the cooking pot. Cook with the lid on. You may need to check if the vegetables are cooked properly and add more water to it every now and then. Make sure that the vegetables are cooked well and there is not much water remaining in the masala (Ideally, the masala has to be dry. Not with gravy). 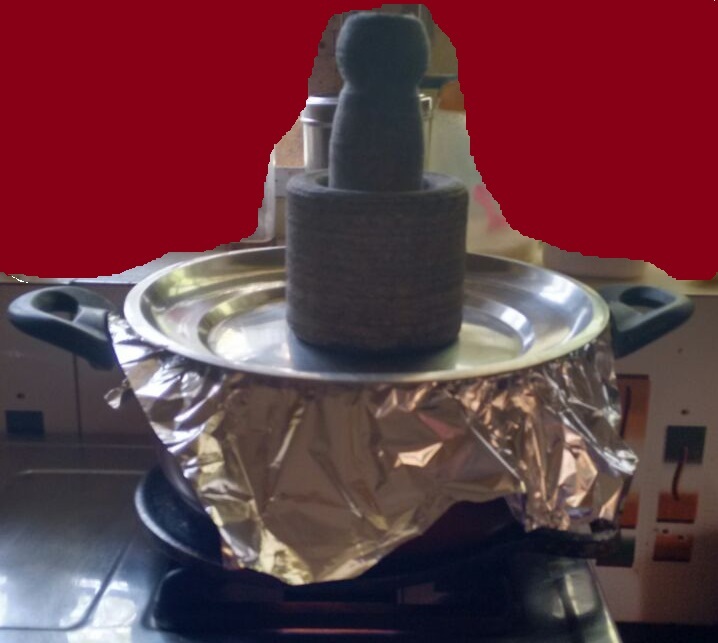 Take a cooking vessel (with a protruding rim; and a perfectly fitting lid) and spread the masala and rice in alternate layers. Make it in such a way that the top layer is rice. Spread the garnish on this. Spread the rest of Coriander leaves and Mint leaves. Seal the vessel with an Aluminium foil. 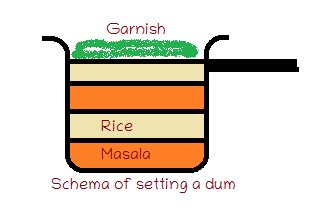 Put a “Dosa kallu” on the stove and keep the dum vessel on it. Cover the vessel with the lid and keep some heavy object on the lid (I used my dumbbells for this). Keep the flame in high for first ten minutes. and put it in sim/medium flame for rest 20 minutes. The foil sealing and dumbbells are to keep the steam with in. The traditional way to build a dum is by sealing the edge with Chappathi Dough. After 30 mins, the Dum Biriyani is ready. 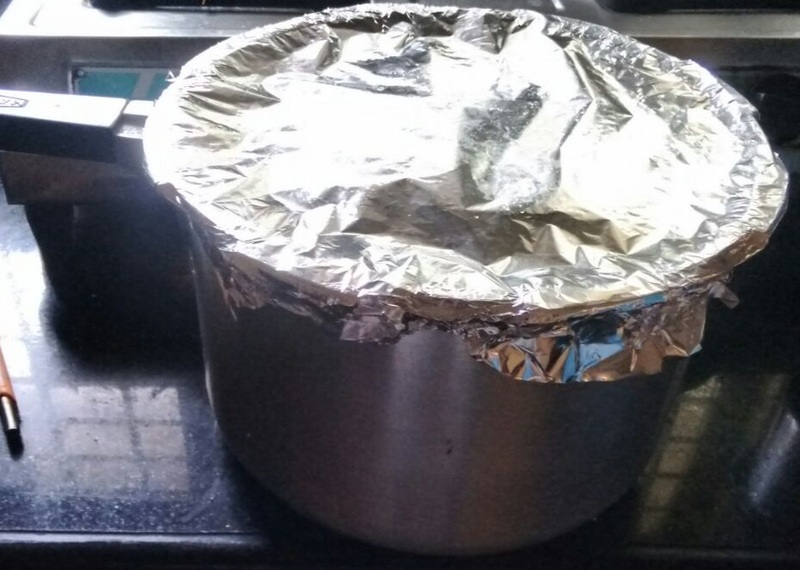 Be cautious of steam while removing the aluminium foil. Transfer the whole content to a vessel with wider mouth so that you can mix it well. Mix gently in such a way that it gets an even texture. Onion Raitha and Papad will be an ideal combination with Biriyani.